A traditional way of exploring the Easter story, telling of the last walk Jesus took to the cross and the people he encountered on the way. In this work the story is retold for children, along with simple prayers of response. 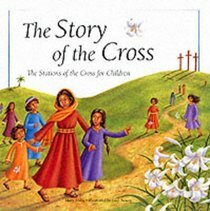 - Publisher In The Story of the Cross, each station of the Cross is briefly explained, beautifully illustrated, and paired with a short prayer. The Greatest Story Ever Told brings the characters and stories of Jesus to life with pop-up, vibrant illustrations. Who Laid the Cornerstone of the World? recounts classic stories from the Bible that children will hear again and again throughout their lives. About "The Story of the Cross"
In The Story of the Cross, each station of the Cross is briefly explained, beautifully illustrated, and paired with a short prayer. The Greatest Story Ever Told brings the characters and stories of Jesus to life with pop-up, vibrant illustrations. Who Laid the Cornerstone of the World? recounts classic stories from the Bible that children will hear again and again throughout their lives.